So after eating completely clean for 3 days, I was super nervous about what I was going to eat after my food wasn't being delivered to me. I mean, I eat pretty clean, but I think I've slacked off on my veggie intake lately because I've been so crazy busy. But that is no excuse; I just need to get smarter and more creative with my veggie consumption. 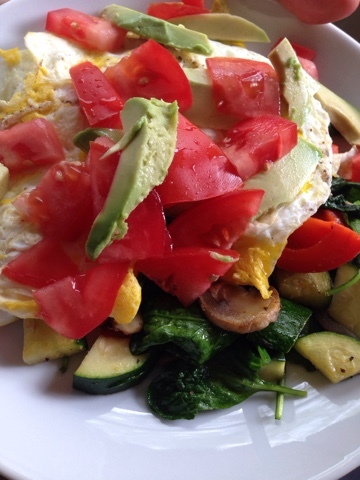 Enter my new favorite meal: Eggs on a Veggie Pile. I'm serious...this is soooo good and really pretty easy if you use some short-cuts and think ahead a bit. My first go at this yumminess, I was at the grocery store and was going right home to feed my family lunch, so I ran through the salad bar and got a ton of raw, pre-cut up veggies (mushrooms, kale, spinach, peppers, onions, zucchini, etc.) and then their whole counterparts for later when I had a few minutes to chop. 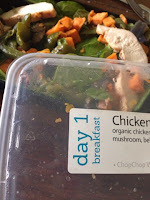 ChopChop Whole Food Cleanse: DAY 3...the finale! So I made it! 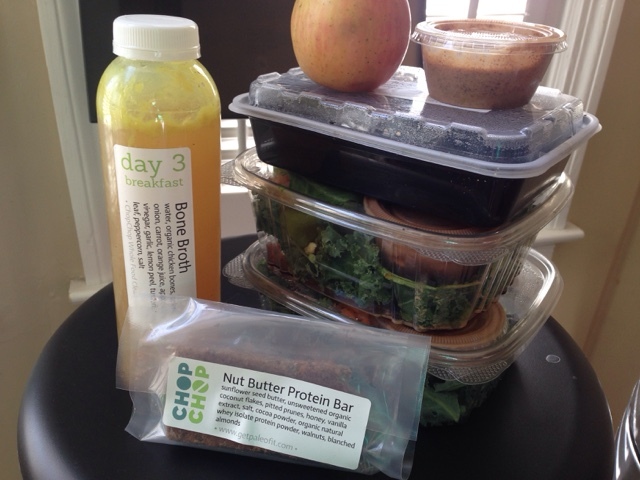 Day Three of the amazing ChopChop Whole Food Cleanse COMPLETE! 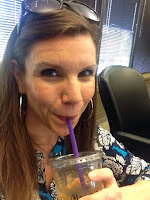 Can you see my excitement drinking my decaffeinated iced green tea? So day three was actually the easiest. I woke up feeling great, my skin was practically glowing and I was down 10 lbs...okay those last two are a lie...BUT I do feel really good and have no cravings at all! I feel GREAT today. I woke up with lots of energy, no cravings, my workouts rocked and really I feel like I just look healthier. I mean, I get that it's only been three days..but I'm going with it. I LOVED day three. Favorite day by far...now if I could have had those delicious raisins today too, oh man, it would have been just too much of some very yummy things. Nothing really. I used some extra fruit/veggie like is allowed on the cleanse and it did my body good! 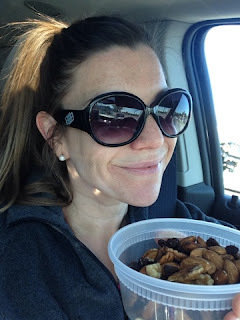 So I thought I ate pretty clean, but now, I wonder if I could cut back a little bit more on the processed protein bars and my chocolate addiction for sure :) I will definitely do this cleanse again-it was just want it said...it was a Re-start! Also, I will totally include bone broth and more raw kale in my diet...who knew? You can't totally tell, but I'm super excited to eat these raisins and nuts! Same deal as yesterday only the salads were a bit different as were the snacks. Bone broth and a smoked salmon "scramble" for breakfast...which I totally ate as a mid-afternoon snack with a tiny drizzle of last night's dressing on it for a bit more flavor. 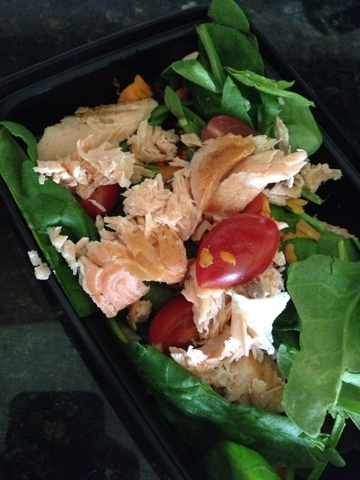 The salmon salad for lunch was yummy and citrus-y. The snacks were some raisins and raw, unsalted nuts and two protein balls. Both were weirdly delicious. The raisins were my favorite...they were so sweet and seemed like a real treat! That sounds kinda sad, I know, but when you have like 26 sweet teeth in your mouth, I'll take what I can get. Then there was a Mediterranean salad for dinner. I was feeling super tired...like sleepy tired...but that's okay. I think I eat pretty clean, but I do have this chocolate addiction and I love wine, sooooo it could totally be part of cleansing. I also worked out for about 4 hours (deal of my job) and so that could have added to my lethargic-ness. 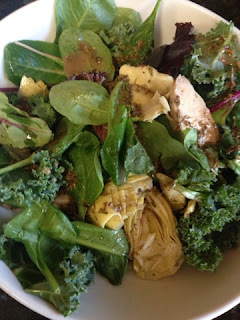 The dinner salad dressing. I have loved all of the dressings until this one. I poured half of it on my salad and mixed it all up. Oh man, I wish I hadn't done that. It had something in it that was so bitter that I actually didn't finish the salad and had a small apple and a carrot instead. Sad face for real. Overall, still think it's really good. Also, I'm super glad that I am doing it along side a bunch of awesome women so we can encourage each other, give each other ideas, etc. Today was my first day of the ChopChop Whole Food Cleanse...and it was great! 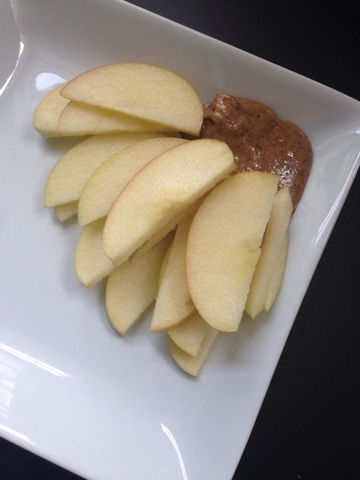 Paleofit , a local Kansas City company, offers lots of yummy Paleo food and now they have a whole food cleanse. I decided to try out the three day cleanse: they also offer a 7 and 10 day version. It's pretty sweet because they provide and deliver ALL of your food for the cleanse. You don't have to prepare at all really in regards to shopping and such. Plus, if you eat with your family or friends, you can still eat something-which is a major benefit in my house. For day one I was given a bone broth and scramble (which is basically another salad) for breakfast, an apple and almond butter for morning snack, a yummy chicken salad deal with kale and mushrooms and such for lunch, a protein bar for afternoon snack and a delicious green salad with a nice piece of salmon for dinner. Since I practice intermitant fasting...yay! I didn't start my eating until noon. I began with my lunch salad...which was really really yummy...then basically ate through the rest of the day ending with dinner at 6. Everything was super yummy. I felt great...but have to be honest...I was a bit hungry...BUT that is no big deal...it's okay to be hungry. I've done many cleanses that don't even let you chew anything at all..so day one of this cleanse was a cakewalk! The food was great..the packaging was super easy to store and labeled by day so there wasn't any confusion on what I was supposed to eat. 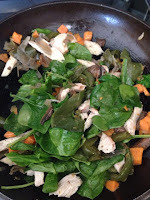 I also received an e-mail from Paleofit telling with encouragements for the start of the cleanse and some tips. They also provide an approved food list just in case you are about to eat your arm off (arms are not on the approved list) or if you are super active and need a few more calories to keep conscious. I felt actually really good...a bit tired...but that could have been from the long and busy weekend and/or my stupid allergies. I feel like I'm getting my body all of the vitamins and minerals it needs without all the crap...so that's awesome! Do each exercise for 90 seconds and then 60 seconds and then 45 seconds...and if you take minimal breaks (as you should) finish up with 30 seconds of each move.